Young people who may have thought that scientists were ‘boring’ and ‘nerdy’ changed their minds after having an opportunity to ‘Meet the Scientist’ face-to-face. That’s one of the key findings of a study published in the International Journal of Science Education by experts from the University of Southampton’s LifeLab project into student-scientist engagement. The ‘Meet the Scientist’ sessions are part of a wider initiative at the authors’ institution to promote health literacy through science education (Grace et al 2012). The LifeLab project is an innovative educational intervention which actively engages with young people, teachers and researchers. The aim is to introduce the science that explains how lifestyle choices at an early age can drastically affect young people’s health and the health of their future children. 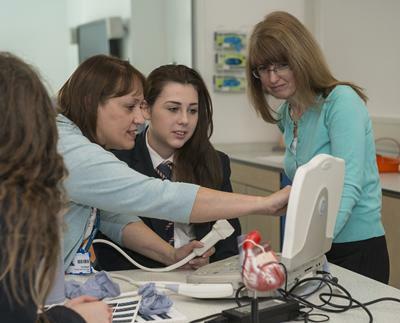 As part of the hands-on practical day, students take part in ‘Meet the Scientist’ sessions where they have the opportunity to meet and talk to scientists, from both academic and clinical backgrounds. Scientists from different areas (bioengineering, genetics, cancer, asthma, nutrition and cardiovascular research) led small group discussions with school students aged 13-15years. Feedback from the school students showed that these short informal interactions changed the students’ expectations of what scientists are like. In their post-session feedback, students pointed out that the scientists they met were not as expected because they thought ‘of a stereotypical scientist [as] a nutty professor’ or because they thought that they would be ‘mad and posh’. Instead, the students found the scientists to be ‘normal and chatty’. As one student noted, ‘I thought they would be quite boring but actually they were quite interesting’. Even when students stated that scientists were as they expected them to be (41%), their reasons drew on positive attributes such as their intelligence, or their ‘normalness’. One student stated that ‘they were a lot like I expected because they were both very bright and were very enthusiastic about what they were doing’ whereas another pointed out that scientists were ‘normal people who had a passion to understand their specific subject’. “Students have been reported to have stereotypical views of scientists as middle-aged white men in lab coats,” said Kathryn Woods-Townsend, co-author of the study and Programme Manager for the LifeLab project. “We argue that a way to provide students with a more realistic view of scientists and their work is to provide them with the opportunity to interact with scientists during short, discussion-based sessions. Although the students were not asked directly ‘What kind of people are scientists?’, their pre-conceptions of scientists prior to the sessions exemplify the inaccurate stereotypical images that most students held and their comments after exemplify the students’ emergent views of scientists as normal, and even interesting, approachable individuals” Woods-Townsend continued. Scientists themselves viewed the scientist–student interactions as a great vehicle for science communication. Interestingly, the scientists were aware of the stereotypical images held by students and felt this needs further attention in order for students to become more interested in science. The sessions also raised further discussion from the scientists about the need for future training to develop their skills as science communicators particularly their ability to engage in questioning and interaction sessions with young people. The study was carried out by academics from the University of Southampton’s Education School and Mathematics and Science Learning Centre. LifeLab is based at University Hospital Southampton NHS Foundation Trust. This study was funded by the Primary Science Teaching Trust and the Engineering and Physical Sciences Research Council (ESRC) and supported by grants from the Medical Research Council, Garfield Weston Foundation and NIHR Southampton Biomedical Research Centre, University of Southampton and University Hospital Southampton NHS Foundation Trust.